Bloombex is a binary options trading company established in 2009. You have to make a deposit before you start trading, and you could lose your money VERY fast (especially if you don’t know anything about trading). They say you will make a profit with every trade because they know when and how to make the trades, however this is NOT TRUE! You have to learn how to trade and know exactly what you are doing before you can jump into this. Bloombex Options offers their services on a web-based platform that is easy to use. They have many things to trade, including commodities, currencies (Forex), stocks, and indices. Private investors can even request to have specific financial assets added. This is great for EXPERIENCED traders. I have done many reviews on other binary options trading company scams (Omega Options, The Money Glitch, The Cobalt Code, etc.) and they are all very similar. There Are Easier Ways To Make Money Online! They have taken some peoples’ hard earned money! How Does Bloombex Options Work? Bloombex has all of the trading instruments you need, and they allow you to invest on a HUGE variety of financial assets in real time. Just like with any trading platform there will be risks! You are in control of your investments, and you have to decide if it is the right time to invest. 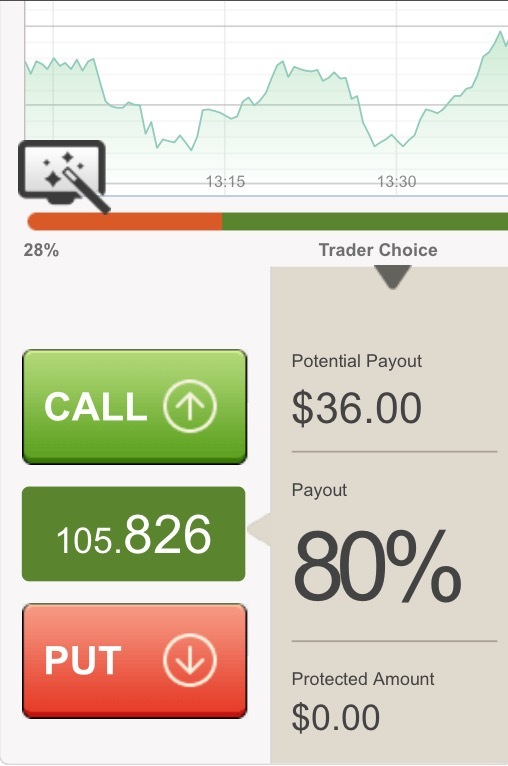 This trading platform apparently allows you make SMART decisions so you can make a profit. You do not invest if there is high volatility in the market or if there is no particular economic event. Bloombex makes announcements about financial events to their investors, and they influence the market. Your account manager is supposed to inform you of these events, and they will want you to invest right away. However, all I ever get are emails about investment opportunities (meaning they just want your money). Once you invest, then you just make trades on the market. However, Bloombex will make the trades for you, so they have control over your money. NEVER let someone else control your money! One Touch Options (only on weekends) – Return of up to 500%, but it is just a prediction and a 50/50 chance you could win. 30-60-120 Second Trading – You choose an asset, enter investment amount and click “CALL” if you think the price will rise or “PUT” if you think it will drop. Ladder – You can make several predictions on the same asset. Pairs – Choose which two assets will outperform the other when they expire. Double Up – You could double your profits by doubling up if it is a “sure” profit. Rollover – This allows you to postpone the expiry of your trade (available up to 10 minutes before expiry). Long Term – You select your asset, select expiration time, choose how much to invest, then make a prediction. 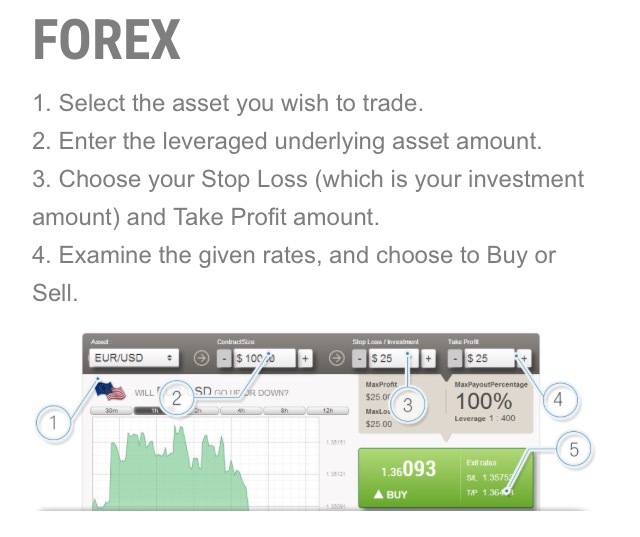 Forex – Here you choose your Stop Loss and Take Profit amount, then choose to buy or sell. If you don’t know how to use these features I suggest you contact your account manager. Bloombex allows you to cancel a position after you select a direction (Up or Down), which means if the value suddenly changes you can accept or decline the investment. Once you position is approved it is displayed at the bottom of the screen. All of these features must be mastered if you want to become successful, because they help you make better decisions. If you make a wrong decision then you are out of money! Bloombex also has social trading called Bloombex Follow, where you can find successful traders and follow or copy the moves they make. How Much Does Bloombex Cost? In order to start trading with Bloombex you have to make a deposit. You can use your credit card, Paypal, Skrill, and Neteller. After you open an account an account manager will reach out to you and assist you with the deposit, as well as help you with the first steps to take using their platform. You have to deposit at least $250 into your account to start trading. There are also no fees when you want to withdraw money, just make sure you do not have any open positions when you request a withdrawal. You get a matching bonus after you make a deposit (which means you will get another $250), but you can only withdraw it after you achieve a 27x turnover. The Terms & Conditions were a little inconclusive because they did not specify the withdrawal restrictions. Anything that isn’t clear on something means they are hiding something! Create An Online Business for FREE! They cover fundamentals as well as technical analysis. There is a description of how to use all of the features, but you also have the option to do private 1 on 1 sessions. I would suggest you take advantage of that, however I did not try that and I do not know if it cost extra or not. 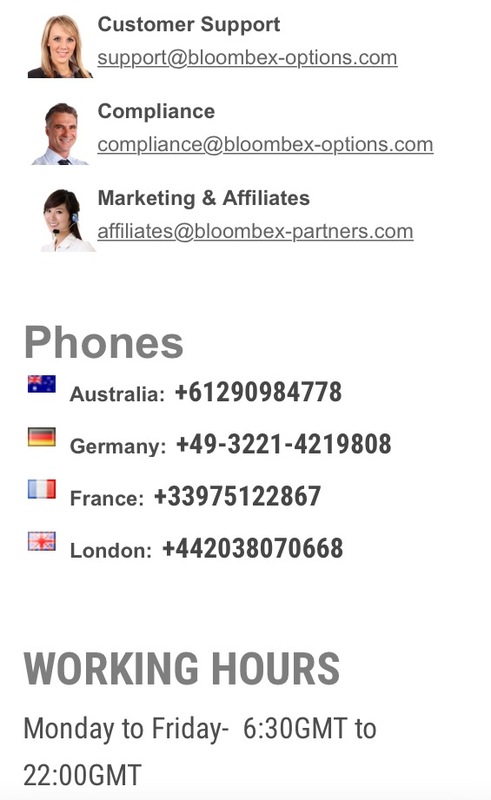 Everyone that signs up with Bloombex is assigned an account manager, and they speak many languages. If you are a beginner you NEED to take advantage of this. Their customer support 24 hours a day for 5 days a week, and you can contact them through email, online chat, phone, or Skype. They also have email accounts for the account managers on their website. Personally, I like their live chat and was helped very quickly. I did, however, have trouble when I wanted to cancel my account after using it. They were very pushy and wanted to make a sale. They were also rude about me wanting to cancel. I was able to cancel because I had not invested any money yet, but I left on a bad note. They used to have an affiliate section, but I could not find it when I searched recently. Learn About Affiliate Marketing Here! Bloombex Options has updated tools, but they are just like all the other binary options scams out there. BE CAREFUL with this program. You can make the deposit, but I would not trade anything until you have completed most, if not all, of the education and training. You can lose your money VERY fast if you do not know what you are doing. This is no “push button to success,” and you will NOT make money quickly. Trading isn’t bad, but you have to go about it very carefully and find the right broker! I like Bloombex, but lately they have been taking peoples’ money without their consent, which means it is a SCAM! Do NOT invest in this program! If you want to learn to make money online like I did (the free way) check out my #1 recommended program! I have been scammed and scammed and scammed again. I invested with four binary companies and lost all of my investments totaling 290,000GBP. Then I was contacted by someone offering help as a company who specializes in binary recovery. I was scammed by them again. By the end of it all, I had lost all of my savings and I was in serious debt. I was desperate for help and that made me vulnerable to recovery scams. My husband is not around anymore and I have an 8-year-old son with learning difficulties. The pressure of being a single, working mother with a child who needs so much additional attention and support became overwhelming for me. I also felt too traumatized to trust anyone else and I was very afraid, but I had no choice other than to trust Geminihacks.com. They have been incredibly helpful and supportive and also very understanding about all of my fear and concerns they helped recover all of my funds back within a week using unethical means I feel quite, tremendously joyous about the decision to use Geminihacks.com I really hope that others do not have to go through what I did, and I wish that I had realized before things were so bad that I was being scammed. I hope my story might help others to not be fooled the way that I was. There are a lot of scam artist everywhere proving to help recover lot funds never believe them, I also have been a victim of this option scam and I was also scammed while trying to recover my funds. I also wrote an article on how to prevent victims and others not to get scammed anymore. I hope we can all fight and get our lives back as I did. Thanks for sharing! Everyone needs to be careful with theses scammers, and recovering your funds can be hard also because it is hard to trust people. Thank you for the info, and I hope it helps someone! I had very huge doubt on the possibility of me being able to recover the huge finances I lost to a ponzi scheme, I even lost all hope. And also if you have lost your hard earned money to Forex trading, Romance scams, Binary Options or any online investment of any sort and you are looking to recover then you should contact them now. Sharing my experience with fake brokers. At Rescuedial.com their genuineness is the real deal, especially when I most needed it. I was a victim of a false brokers scam working with crypto traders, these brokers insisted I wouldn’t be carrying out the trading myself, instructed me to leave it to the professionals so they can make a lot of money for me, Total BS! They made winning trades with the loosing trades to make my account look legit, all the time and encouraging me to add funds to take advantage of a speculative forecasted big winner. Then they leave you to your trades to wonder what the hell to do because of lack of experience, which will only lead to you seeing your account run out. Reading so many stories here from victims can’t make me stop thanking God. Still a miracle how Rescuedial got this done successfully. Thanks for sharing your experience Ellen! These guys are terrible. I also did business with them about 2 years ago and got scammed about $378,000, I contacted Birman law who also took 10% from me and did nothing about getting my money back. I was particular about this money because it was my retirement fund. I couldn’t hold back nor give up until a friend referred a wealth recovery expert (adler.frank50@gmail. com) who recovered 80% of my money plus bonuses for me. I am never trying Binary options ever again in my life. The awful feeling is not worth it to be honest. Thanks for sharing Stella. I’m glad you were able to recover most of you funds! 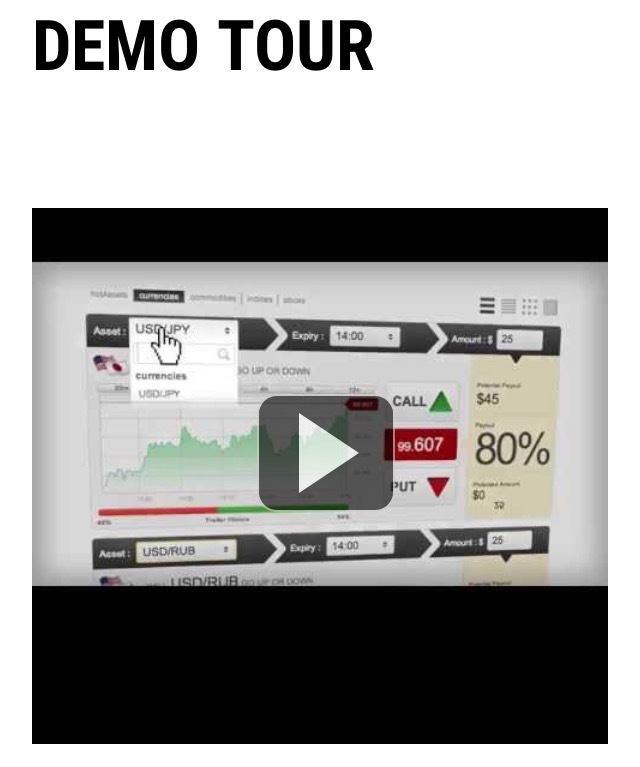 Binary Options is a scam! Bloombex is a big scam too. I deposited $106,000 with them and they managed my account for me. In a day my account went from $106,000 to $0. The broker bought huge trades without stop loss, without my consent, and it went in the wrong directions. I lost all the money to them. I had to reach out to a recovery expert jeremywyatt@consultant.com to help me recover the money back. After a while I decided to withdraw some funds from my trading account I could tell something was wrong, unfortunately my request sat pending for weeks, no one was picking my phone calls anymore, response to my emails was lesser and at a point stopped, I had to try charge back which didn’t work out, I paid a law firm in Israel but they couldn’t be of help, another money lost on that.. Finally I stumbled across this company calagarysecurity.org, they did what I never believed in, firstly I had doubts on how they were going to get my investment back, but trust me I got about 80% back. That’s awesome Kathleen! I’m glad they were able to help you recover most of your investment.